"Alan Turing was one of England’s most influential scientists of the twentieth century" according to Academic Science marketing team. Photo: Enigma by Rama. CC BY-SA 3.0 via Wikimedia Commons. He is best remembered as having cracked the codes used in the Enigma machines, enabling the Allies to defeat the Nazis in many important battles, particularly in the Atlantic Ocean. While this achievement which arguably helped to bring the Second World War to a quicker end has been brought to the fore through popular histories (including The Weinstein Company’s The Imitation Game starring Benedict Cumberbatch as Turing), much of Turing’s less well-known work has shaped the field we know today as ‘artificial intelligence’. Pioneering the field of ‘machine intelligence’, today we celebrate all of Turing’s achievements and the legacy his research left. Find out more about some of the key events that shaped his investigations with this interactive timeline. Alan Turing’s lost notebook by Jack Copeland, FRS, NZ, Distinguished Professor in Arts at the University of Canterbury, New Zealand, where he is Director of the Turing Archive for the History of Computing. 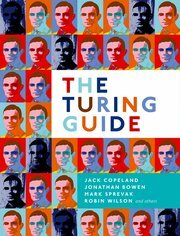 He is also a co-author of The Turing Guide.